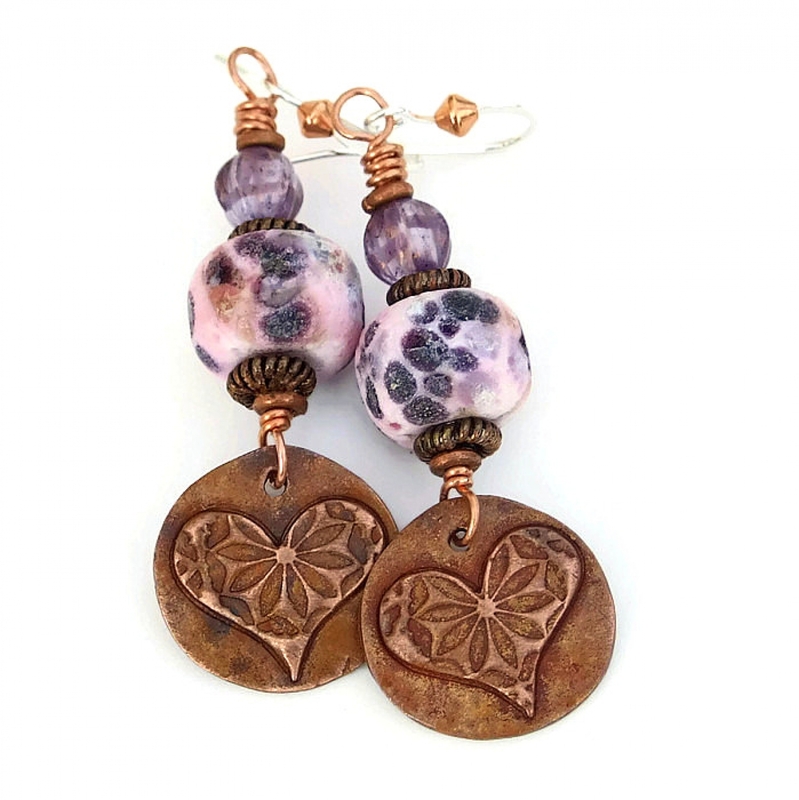 The FLOREANA handmade earrings are some of the most unique and prettiest Valentine’s Day earrings around. But they are not just for a Valentine’s Day gift - their alternative boho design makes them perfect to wear any time of the year. 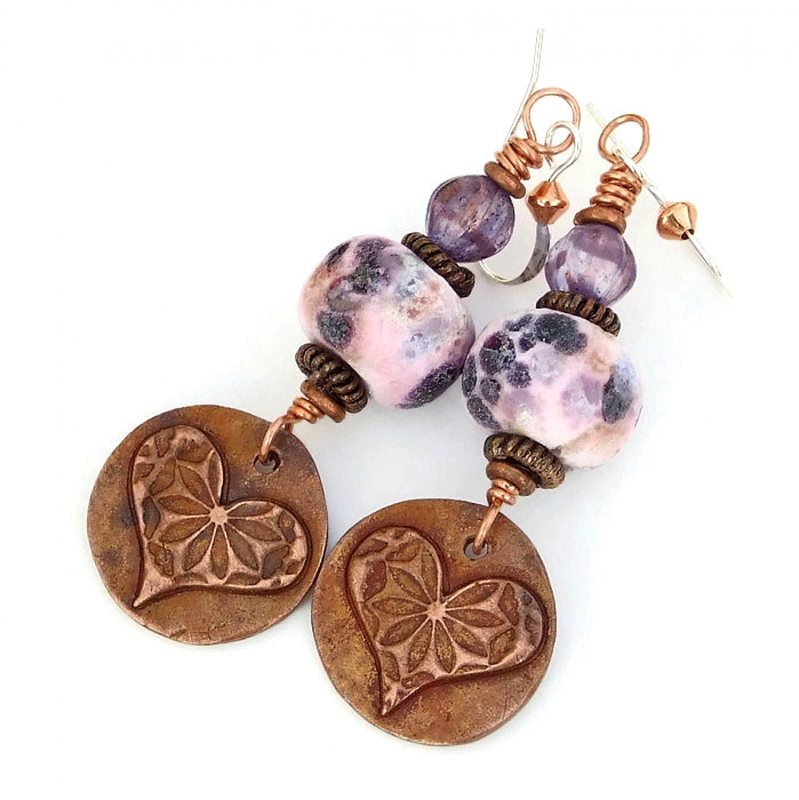 The earrings feature artisan made copper charms with a raised heart and flower design. 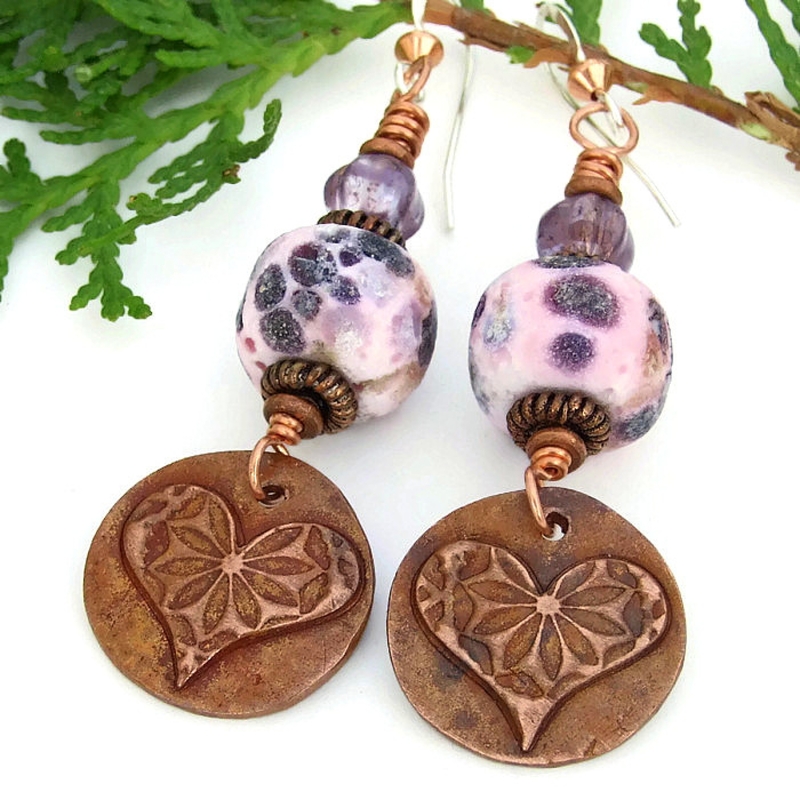 Above the heart charms are rustic pink lampwork glass beads with speckles, also artisan handmade, and medium purple Czech glass melon beads. 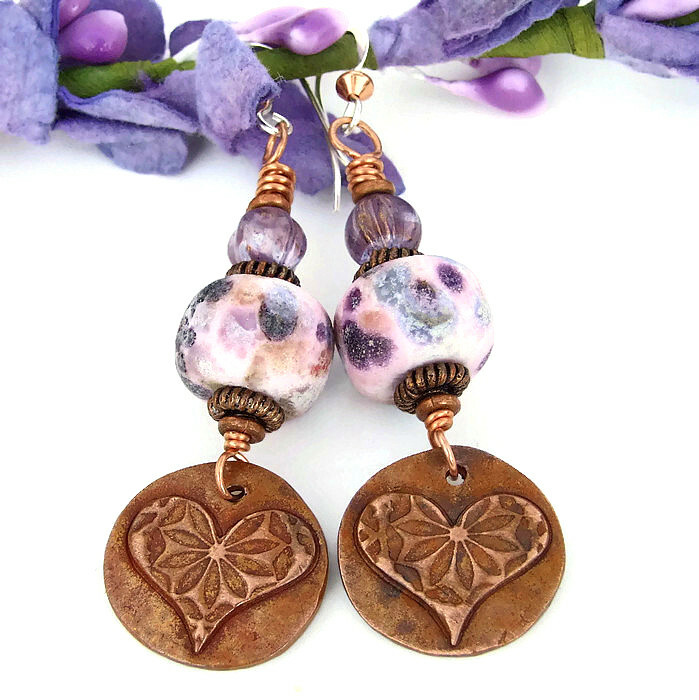 Carefully designed and handmade by Catherine of Shadow Dog Designs, the FLOREANA hearts and flowers earrings makes a perfect gift for the woman who loves unique heart jewelry with a boho flair. 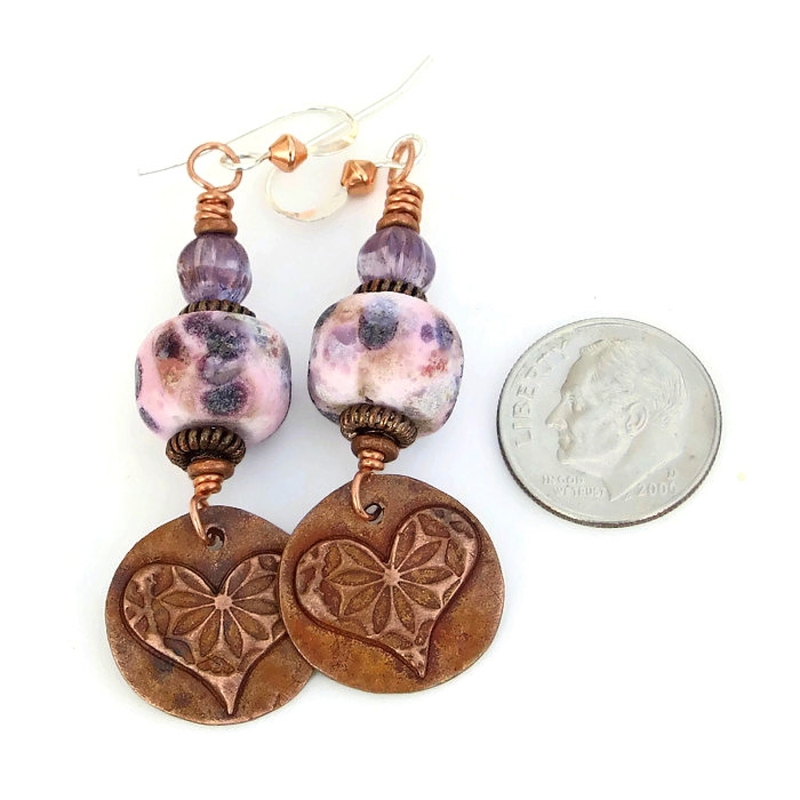 *** For a better understanding of the relative size of the FLOREANA artisan handmade heart earrings, please be sure to check out photo # 6 for a size comparison with a dime. 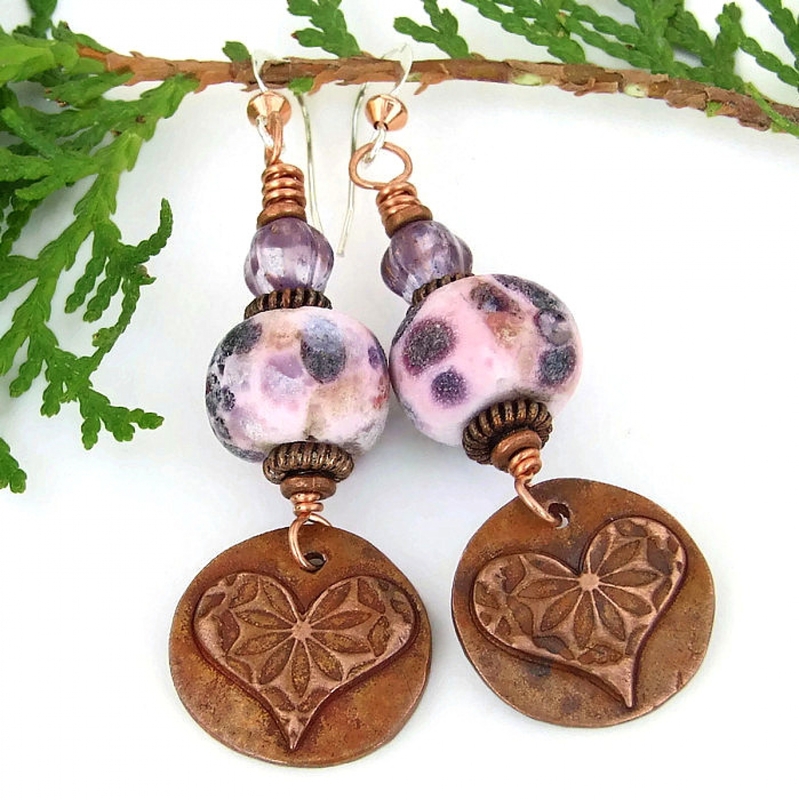 The copper hearts with flowers charms used in the FLOREANA earrings were handmade by artist Kristi of KristiBowmanDesign. Kristi created the round charms from start to finish with copper precious metal clay, an artist's clay that is saturated with tiny copper particles, an organic binder and water. She molded, shaped and imprinted / carved each individual charm and then put the pieces in a kiln. The hearts were fired at a high heat, where the binder and water were burned off, leaving pure copper. To bring out the glorious patina of copper, the charms were heated with a butane torch and then sealed to protect the color of the metal for many years to come. As you can see in the photos above, the hearts are raised against the background with an imprinted flower design. You can run your finger over the beauties and feel the wonderful texture. The backside of the copper hearts with flowers is slightly concave. 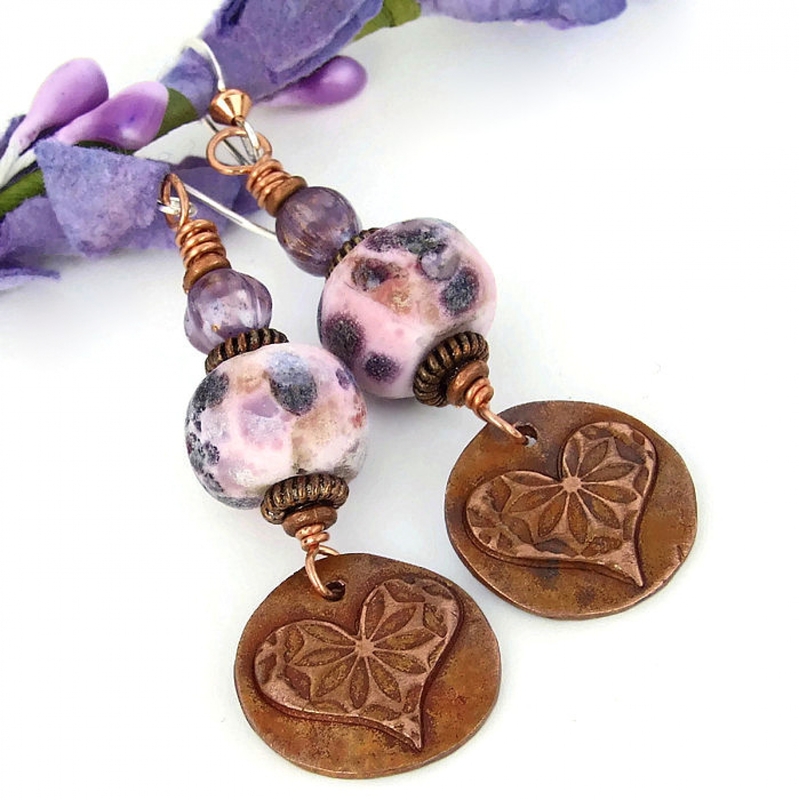 The rustic mottled pink lampwork beads were individually created by Jody of Inspire Glass Studio. 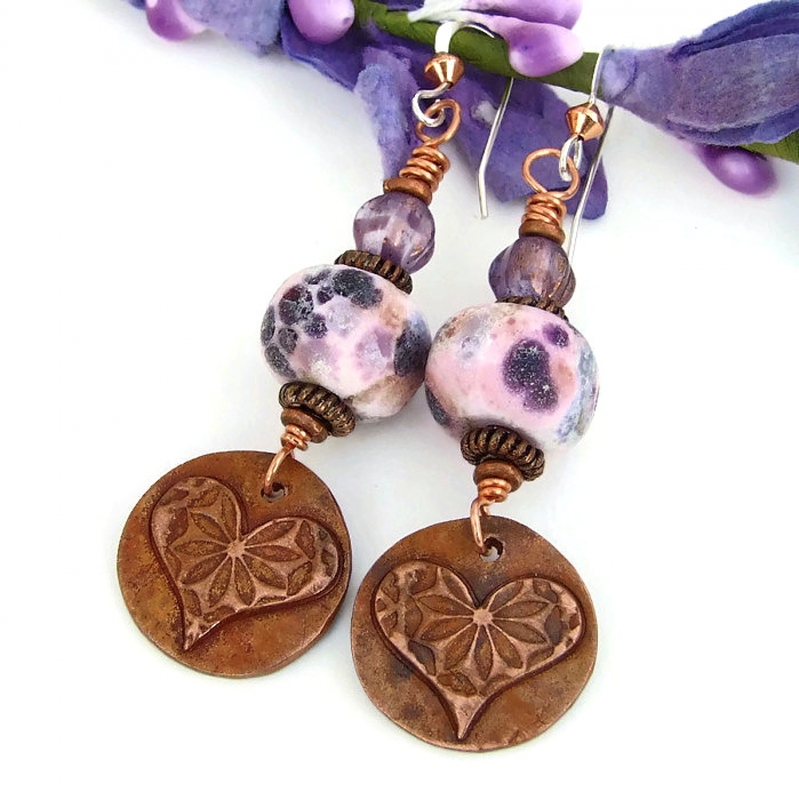 The beads started out as pink glass with splotches of lavender. When still in the molten stage, glass frit in grays, purples and ambers was applied for the mottled, speckled look. 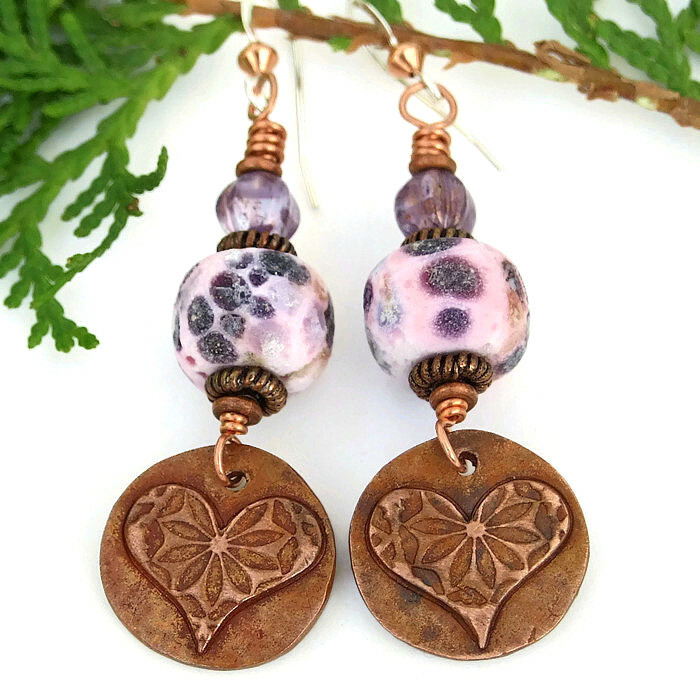 After cooling, the glass beads were acid etched for a very rustic feel, a perfect complement with the copper hearts with flower charms. The lampwork beads were capped at the top and bottom with copper wire spacers. Just above the speckled lampwork glass beads are Czech glass melon beads. The beads are a translucent, medium purple and have a light metallic PIcasso finish to help them catch the light beautifully. The rich looking beads have ridges that lend additional texture to the overall design of the earrings. 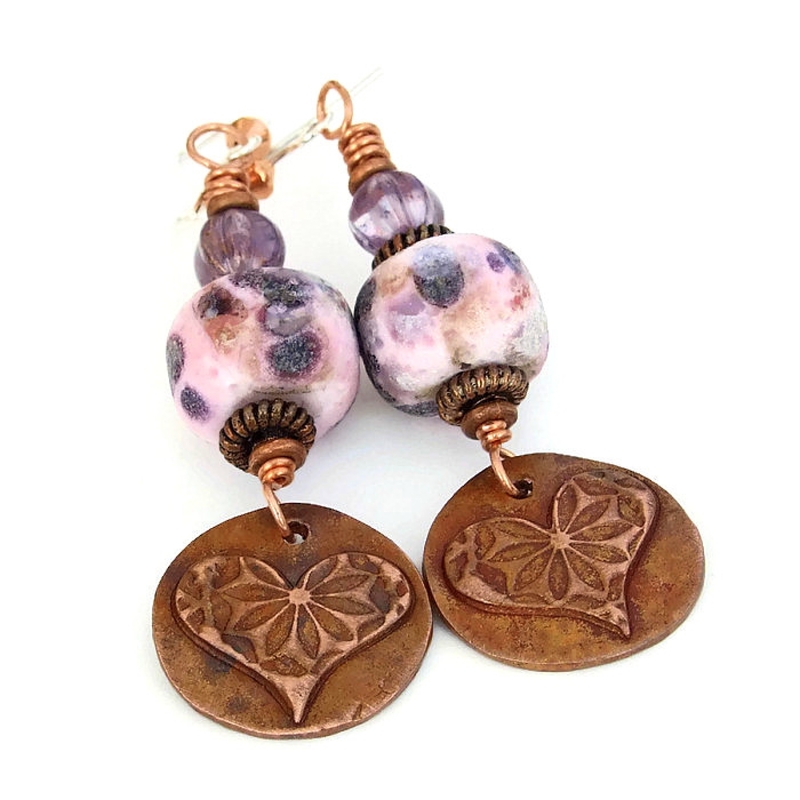 All of the elements used to create the FLOREANA boho earrings were carefully wire wrapped on copper wire. A double wrapped loop at the top of each earring was connected to sterling silver French hooks. Copper bicones were added for extra adornment. Through the centuries, hearts represent never ending love. Flowers are a symbol of spiritual awakening; also they have been symbols of generosity and love when they are given away. Copper is said to allow the wearer to recognize barriers in the path of personal development. Even though man made, glass carries the energies of transformation, rebirth and communication. Silver is a metal of love and healing; it is a mirror to the soul, helping us to see ourselves as others see us. 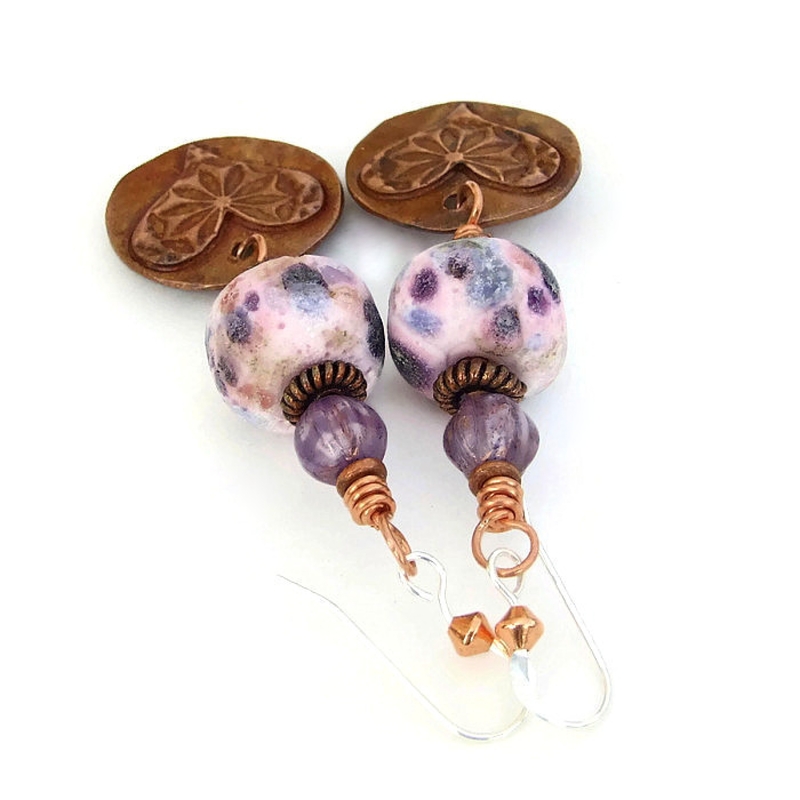 The unique FLOREANA artisan earrings were carefully designed and handmade in a dog friendly, smoke free studio. They will be carefully packed in an organza jewelry bag with tissue, perfect for gift giving to a loved one . . . or to yourself!